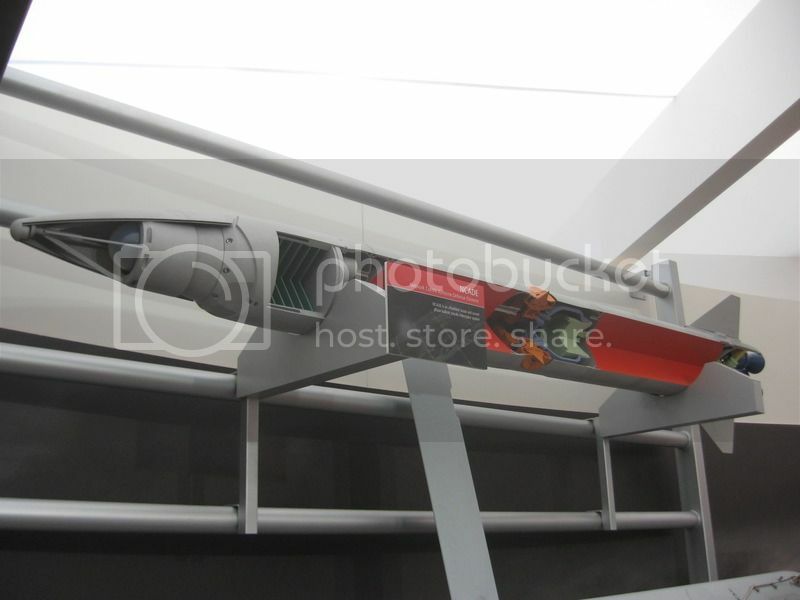 Best picture on page 6 Lockheed Martin 'Cuda' small AMRAAM for internal weapons bay of the F-35. I count 12 missiles total. Can some of the experts here at SP estimate its size and therefore its potential range from these pictures? |1| A Lockheed Martin model shows how its “’Cuda” concept for a small AMRAAM-class radar guided dogfight missile could triple the air-to-air internal loadout on an F-35. The missile is about the size of a Small Diameter Bomb and fits on an SDB-style rack. Would it not make more sense, given the limited space available in a small missile package, to go with IIR (hardened against DIRCM)? Also, how about using it for missile defense (anti-SAM & anti-AAM)? maybe the choice of radar guidance was to limit the exposure of the aircraft? IIRC, IR guidance require the missile to be mounted such that it can acquire the target just before launch using its own seeker. something that can be difficult using internal bays. on the F-22 they used a trapeze system, on the F-35 the sidewinder compatible hardpoint was mounted on the door, etc. using radar guidance, the missile can be just ejected out of the bay along a preprogrammed course. which means that it not only can be fired with less risk to the stealth of the plane, but also means that it doesn't have to have special mounting systems to make use of internal bays. 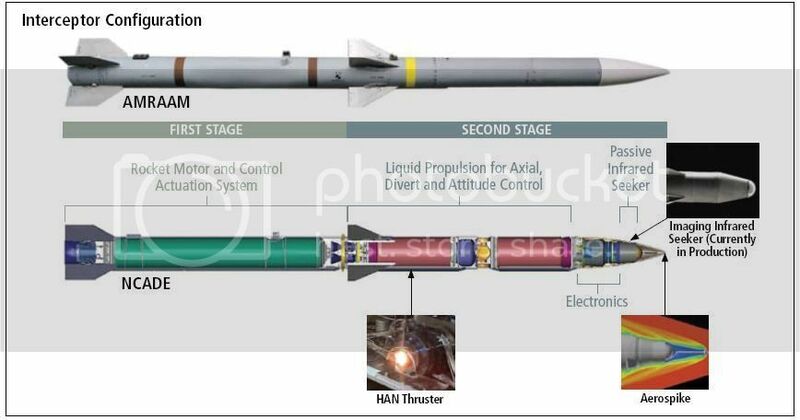 the Small Diameter Bomb size is interesting.. i seem to remember that at one point, the F-22 was predicted to be able to carry 8 SDB's along with 2 AMRAAMs and a 2 Sidewinders.. if these 'Cuda' missiles use the same mounts, an F-22 could conceivably carry 8+ 'Cuda' missiles in an air to air role, plus the larger systems. i would imagine however that the small size and use of radar guidance would really limit the range of the missile. also, it seems lockheed copyrighted 'Cuda' back in 2011. The latest IIR missiles (like the Aim-9x Blk2) have lockon after launch (LOAL mode) so having a lock before launch is no longer needed. Since these are dogfighting missiles, the target will be in full view and within the tracking ability of EODAS the whole time. With a datalink constantly updating them with the target location, an IIR seeker is not a problem. Another part of the problem with a radar seeker is the the nosecone is hollow (wasted space). With such a small missile space is at a premium and an IIR seeker is more efficient (no wasted space in the nosecone, smaller battery, etc). And yes, currently the F-22 carries 8x SDB, 2x AMRAAM, and 2x Sidewinder. Since the F-22 lives in BVR, a better option might be 4x AMRAAM, 2x Sidewinder and 4xCUDA. They might continue the work done on the NCADE. Notice that most to the seeker fits into the normally empty AMRAAM nosecone. Compared to the NCADE seeker, more space can be saved due to not needing the shockwave spike (or whatever that is) on the NCADE. Just like the F-22, I think it's a mistake to go with too many CUDA missiles. 3xAMRAAM (or 4 with the Blk5 upgrade) and 4xCUDA would be the ideal A2A loadout IMHO. I wonder how big the upper stage of the GD/Westinghouse AAAM was. Even the upper stage had TVC and dual-mode guidance. And folding wings. Damn, every time I think about that thing it seems like such a shame it was never pursued. It was my fav too. The thing to remember with the 2nd stage of the AAAM was that all the heavy lifting (up to it's max altitude) was handled by the 1st stage booster. The 2nd stage was able to get the job done due to it being able to trade potential energy for maneuver energy (aka gravity). A CUDA would not have this benefit since it would be fighting gravity the whole way. What happened to the dual band radar and infrared seeker for AAM that being developed during the late 1980s? I believe the idea was for the missile to fly to within Lockon range with a hollow nose cone, then eject the nose cone to expose the dual band seeker to lock onto the target. I ran some simple cylinder calculations and found out that if the CUDA uses a 7 inch body that it will have the a little more internal volume (at least 10%) than an AIM-9X. I added calculations for 6 and 5 inch bodys. Different drag will have to be accounted for and if a radar seeker is used then even more volume will be lost for the fuel. so if we assume the same warhead as a sidewinder, and a radar seeker off an AMRAAM, what kind of range could we be looking at here? The problem with that kind of comparison is that the Radar seeker + dead space + batteries = much more volume than a 9x's IIR seeker + batteries and I do not know how much. So can you enhance range with a higher energy propellant? I am assuming if there is going to be a boost phase intercept mode you need a faster burn out speed? What are the rows of circles just down from the nose? Manouvering jets? It says it's a HTK "a small AMRAAM-class radar guided dogfight missile ". I speculate from these tidbits that this missile will be launched in LOBL mode to "reduce exposure" (though I'm not sure it can't be done with modern IR guidance). The "AMRAAM class" suggests to me that this small missile will have a range similar to an AIM-120 (no warhead inside, use the space for fuel). It's "dogfighting" capable, so the crown of maneuvering jets close to the nose suggests a very agile vehicle, In consequence, It's small, and can be stowed in greater numbers. It also says in the article it's "Multi-role"; so I'm thinking HTK=antimissile intercept capable, a Mini-PAC, maybe?. Kinetic Kill vehicle for A2G or anti-tank? I'd assume that multi-role would mean both BVR and WVR modes... It'd be asking too much for an ATG mode (That said I've always liked the AGM-122 Sidearm). LOBL is "Lock On Before Launch"
I think you meant LOAL "Lock On After Launch". This is such a good idea it will most certainly go nowhere. Noted, never thought of it, but I'm still in the foggy terrain of speculation. I meant LOBL, in the sense that, using Electro-Optical Targeting System (EOTS) or own radar, the munition can be locked on *before* the launch event, while still stowed inside the bay. Not intending to deny LOAL at all, though. But I'm still speculating. LOBL & LOAL refer to a seeker's own ability to detect and guide the missile to the target. LOBL can never happen while a missile is in a bay. The missile must acquire the target on it's own prior to launch to be called LOBL. The Aim-9M in the F-22 is just this type. The -9M is moved into the slipstream for as long as it takes for the seeker to acquire the target (LOBL). It is then, and only then, that it is launched. The F-22's AMRAAM is a true LOAL missile. The F-22 tracks a target & communicates with the AMRAAM as to where the target is. It then opens its doors and ejects the missile. If the target is close enough, the AMRAAM will immediately begin to seek out the target as it travels towards the target. If the target is farther away, the AMRAAM will fly towards the target for some distance before activating its own seeker. The possibilities for this concept are tantalizing. Imagine if they can match or come close to early AMRAAM iterations in kinetic capabilities. I think it might be a stretch unless they've developed higher density propellants BUT one could envision a AMRAAM replacement evolving from this concept if it does work out. I like Spuds idea of F-22s carrying 4 -120Ds, 4 CUDAs and 2 -9X, especially if your CUDAs get -120A like range. Thanks for the explanation, Spudman. That clarifies much of the misconceptions I had. It is also worth noting that the active-radar seeker has a relatively short range, and is used for terminal homing - it is dependent on the aircraft's radar for acquisition and initial guidance (assuming it is being fired from more than 15-25 km). It's also worth noting that both the AIM-120 and previous Phoenix could go active right from the get go for short range shots. Do you refer to THAAD for the choice of kill mechanism? Strap a 71" x 7" booster on the back of the CUDA for an ALRAAM. Kind of like GD AIM-152 without the multi-mode seeker. Direct, long-ranged AMRAAM replacement. Active-radar homing has always had a bit of a medium range / dogfight mystique to it. Isn't this kind-of the point of ARH? There already is a two stage AMRAAM, the Raytheon NCADE. It is configured for BMD with the AIM-9X IR seeker and hit to kill but you could use the two stage rocket motors with an air to air active radar seeker and anti aircraft hit to kill warhead. Because IR domes are physically weak, draggy and the performance of IR seekers drops with increasing missiles speed (turbulence and heating of the seeker dome are both problems) it is not a good choice for high speed missiles. I would guess that CUDA is radar guided, because CUDA has a very high burnout speed. High velocity dovetails nicely with HTK guidance. Removing the warhead reduces the empty weight of the missile, and thrusters can produce enough force to perform tight turns even at very high speed. It also reduces the reaction time for the target and increases the lethality of the missile on impact. Because IR domes are physically weak, draggy and the performance of IR seekers drops with increasing missiles speed (turbulence and heating of the seeker dome are both problems) it is not a good choice for high speed missiles. You mean like THAAD and HEDI? I think in each case the IR sensor is shielded for a portion of the flight, until the missile is above much of the atmosphere. NCADE might actually offer better range due to more % for fuel and 2nd stage being liquid fueled. Take note that NCADE has an aerospike to protect the IIR seeker from friction heat. Both are endoatmospheric weapons. The windows are cooled. "In the terminal intercept phase, the KV is guided by an InSb staring FPA (Focal Plane Array) infrared seeker, whose window is protected in the initial flight phase by a clamshell protection shroud." George has it. Obviously, thinner atmosphere means less drag. NCADE has the advantage that the IR signature of it's intended target is gigantic. Aerospikes work. But they have angle of attack limits, if the AOA is too high the shockwave will reattach to the dome and the temperature/pressure will rise even higher then what an unprotected dome would experience. Cooling is another option, but it severely distorts the wavefront. Side-mounted windows and faceted domes are more options. Even when the seeker is protected there is still a loss of sensitivity from dome heating and distortion from turbulence. Radar by comparison is almost problem-free at very high supersonic and hypersonic speeds. Now, DARPA is currently working on the elaborate optics needed to correct the distortions produced by a low-drag ogive seeker dome and ALON promises much better material properties then current IR domes. Together they could make high-speed IR missile more practical, but that is in the indefinite future. Yes but remember those are all climbing out of the atmosphere, so the heating problem is a bit less challenging once they're in position for target acquisition. Why not shroud the seeker and then dump the shroud during the last phase? Missile speeds during the terminal homing phase are lower than peak flight speeds and there isn't as much time for heat to build up. Of course, you'd need a command link and possibly a semi-active radar receiver for the BVR shots. Anyway, I always thought the reason why IR was favoured for anti-satellite duties was due the fact that space provides a dark background with no atmospheric scatter. Acquisition ranges with IR at extreme altitudes easily outpace radar. Is this correct?